Thank you to everyone who has been taking part in the Sewing Productivity Project. It's great to follow your progress and read your strategies for improving your productivity. Oh okay then, so it's also nice to get a nosey into other people's lives and see how the organise their lives. So anyway, here is the uber list of sewing productivity tips I've been promising, compiled from things I've learnt from the project along with some tips shared by other participants. This is controversial, but if a UFO (un-finished object to newbies) really isn't appealing, leave it and start something that you're excited about making. If you're not enjoying sewing something, why bother? You can always come back to it. Knowing exactly what you're going to make, along with what details and pattern views you're going with, means the thinking time doesn't eat into your precious sewing time. Less faffing, more sewing! Make a list of all the bits and bobs you're going to need for your project and take it with you when you're going to be near a sewing shop, so you can have everything ready. Gina keeps all the materials she needs for one project in a basket, including two or three pre-wound bobbins of thread. There's nothing more frustrating than sitting down to sew and realising you don't have enough matching thread in your stash. At the end of a sewing session, write down what you need to do next time you pick up the project. It'll save time and head-scratching when you're trying to get back into the project. Everyone is in agreement about this one. Having a dedicated place where you can keep all your sewing gear in one place saves tons of time - you don't need to waste any time gathering your bits before a project, finding tools during your sewing time, or packing up afterwards. And seeing your project all ready to go provides great motivation. 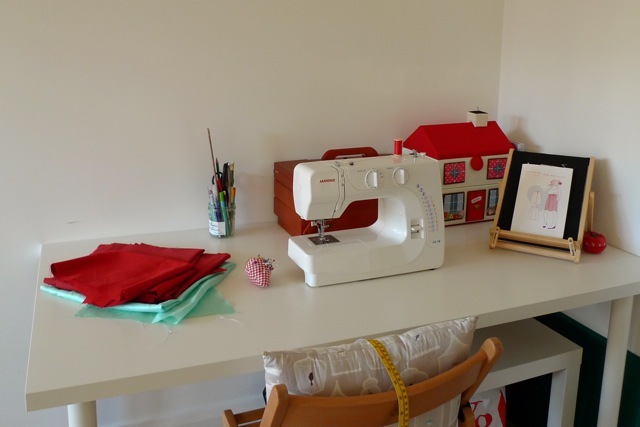 It doesn't have to be grand - my sewing space is a £20 Ikea table shoved in an unused corner of the sitting room. Check out the Blue Gardenia's sewing space interviews for tons of inspiration. Don't let having your own space be an excuse for leaving everything in a mess. I find it much easier to work when I have space on the table to lay things out properly and don't have to go hunting for the seam ripper under piles of fabric and pattern pieces. Don't feel guilty about blocking time out in your diary for sewing and saying no to social engagements if necessary. I find it really important to have time alone to do something creative, and I'm not a great person to be around if I haven't got that out of my system! Having said that, sewing alone can become tiresome and lonesome, so mix it up with social sewing time - like my Craft Club or the classes that Clare has been attending. It becomes scheduled, dedicated sewing time that you're more likely to stick to, and chatting to other people and receiving feedback on your project as you're going will keep you working longer. Don't try to be too ambitious by setting yourself a deadline you'll never meet. Be realistic about what you can achieve according to how busy you are, otherwise you'll just get frustrated and sewing will become a chore rather than a pleasure. A complex sewing project can become a bit overwhelming. A great tip from Laura is to break down what you need to do into manageable chunks (eg. interface the pieces, insert the zipper...), each taking about 30 minutes, and write them down on a list. When you can tick these goals off your list, you'll feel like you're getting a lot more done than if you are thinking about productivity in terms of finishing the whole project. Breaking down your project into small tasks will also make it easier and more appealing to do a bit of sewing here and there when you have limited time, knowing you can tick something off that list. Even if you only have 30 minutes spare, as Julie says, just do it - get that project moving! Or as Gina puts it, you need to slow down to speed up. Read the instructions properly, double check what you're about to cut into/sew over, or it'll take three times as long to rectify the mistake. And, as Diana points out, if the quality of a project is second rate, you're not going to enjoy it, so inject some pride in your work. Rachel finds that she gets much more done when she's not blogging and Casey makes sure she stays offline at the weekends. Writing my blog and reading other sewing blogs can, as we all know, hoover up the whole of your life if you let it. Having said that, I find that seeing what other stitchers are creating, and knowing that I am part of a network of people encouraging each other along, is really inspiring and motivating. I will continue to blog, but will try to limit reading blogs to 30 minutes per day at the most. Anything I've forgotten? Let me know in the comments!